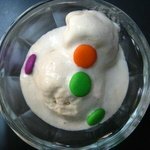 The best time to make this homemade banana ice cream is when you have a lot of spare milk sitting in the refrigerator. Normally authentic creamy ice creams are made of double cream and egg yolks, but this easy banana ice cream is made from just milk and that too semi skimmed. I have added a little bit of condensed milk for additional thickness and sweetness. Even then it remains a low fat ice cream which tastes like any other banana and honey ice cream. So where is the catch? Well, there is none. The only time consuming part is the thickening of milk which honestly can be very boring. But, I assure you the results will be totally worth it. All you need is a little bit of planning. When you put the milk on the stove, do other things in the kitchen and every now and then give the milk a quick stir. Bring milk to a boil, transfer to a heavy bottom pan and reduce till it remains about 600 ml (less than half in quantity). This will take a long time as you have to do this on a low flame. Please make sure the flame is not too high because if the milk gets burned at the bottom, you will have to throw it. Keep stirring from time to time. Once done, leave it to cool down to room temperature. Now mix the rest of the ingredients with the milk and blend it to a smooth puree. Sneak a taste and if you want, add a spoon or two of condensed milk, in case sweetness is less. If not using a ice cream maker, put in a freezer proof box and set for 4-5 hours. Take out and crush the crystals using a hand mixer. Freeze again and after one hour, take out and break the crystals. Repeat 2-3 times till you can make out that ice cream is crystal free. Enjoy the delicious low fat homemade banana ice cream!